﻿ Barcelona 1-3 Real Madrid. A statement of intents at the Camp Nou! 13.08.2017 » Barcelona 1-3 Real Madrid. A statement of intents at the Camp Nou! Rejoice Madridistas! It was a stunning tie in the Camp Nou and we've walked away with a convincing 3-1 victory in El Clasico. 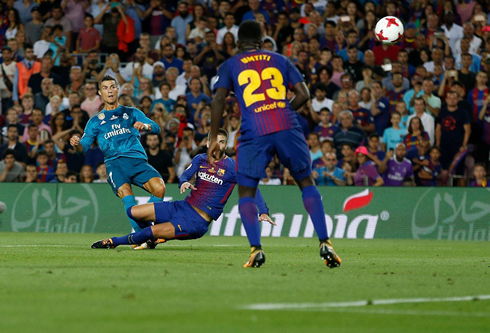 Despite a less than exciting first half, the second half was full of explosion, as Real Madrid walked away from the Camp Nou with a convincing 3-1 victory. 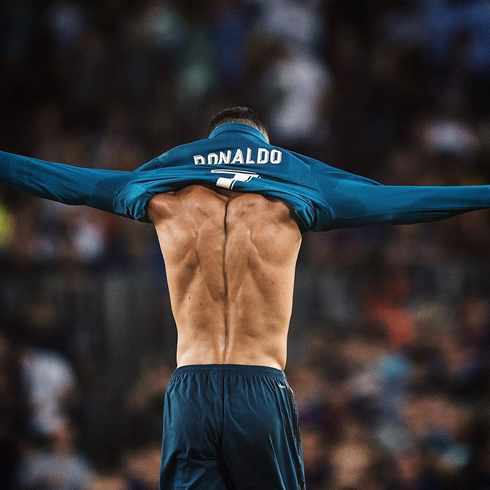 But as I mentioned before, it wasn't without controversy as Cristiano Ronaldo scored a magnificent goal, took off his shirt, and got a red card within a 20-minute period. The Portuguese star will miss the next few games for the Merengues, but at least Real Madrid will now go into the second leg this Wednesday knowing that Barça will have to score at least 3 goals if they still want to dream of challenging Zidane's men for the Spanish Supercup. The game started off far more cautiously than the recent friendly in Miami, as both teams felt each other out. With Modric suspended and Ronaldo still not fully fit, we saw Kovacic and Isco in the midfield, with Bale and Benzema leading the line up top. Chances were seriously a premium in the opening 45. Madrid players looked a bit dangerous racking up three yellow cards in the first half, as the ref seemed to assert control over the match. All in all, however, the first half was woefully uneventful apart from a few half-chances and we went into the half at 0-0. Kovacic, in particular, was a standout of the half, especially defensively. In the second half, both teams opened up and the game soon became an end-to-end battle. Madrid struck first as Gerard Piqué bundled home Marcelo's cross. 1-0 and it couldn't have happened to a better player could it? Madrid would continue to dominate and chance after chance fell to us, but we were unable to finish. And we paid for it, however, it was undeserved. Chasing a loose ball with an onrushing Keylor Navas approaching, Luis Suarez used his best tricks to win a penalty. It was a disgraceful farce, but alas it was given. Messi easily put home the penalty and all of our hard work was undone. 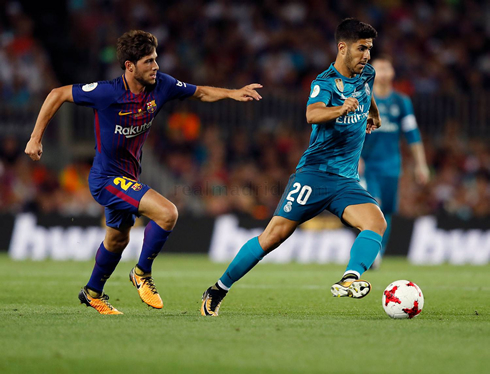 Emboldened by their goal, Barcelona began to attack the Madrid goal as the Merengues' defense held firm, still, the pressure was building. One good thing about pressure, however, is that it leaves you vulnerable at the back and it's exactly what was on the mind of Toni Kroos as he played the ball forward to Ronaldo at the half line. Ronaldo chested the ball down to Isco and peeled off on a run down the left. Isco immediately played a search through ball into space, too far ahead for Ronaldo to catch it in his stride, but far enough away that Ronaldo would have time to gather himself and figure out his next move. What was that next move? A curling shot into the top corner of the net. As Ronaldo cut it, Piqué attempted to match him stride for stride, but Ronaldo only needs a second and he took his chance brilliantly well as he ran off taking off his shirt and mimicking Messi's Clasico celebration from a year ago. However, Ronaldo's joy would be short lived, as he was shockingly given a second yellow for an apparent dive. Coupled with his first yellow, this means he was sent off. Replays showed however that there was contact, but the damage was done. Down to 10 men. 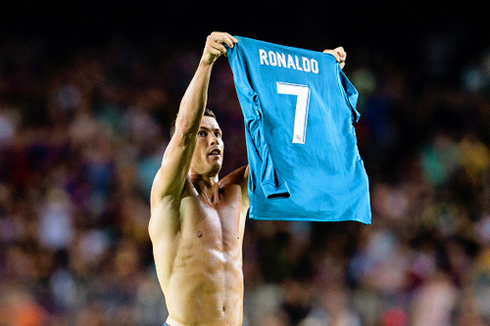 Barça began to push forward again, but the gods were on Madrid's side today. In what was almost a replica of Ronaldo's goal, Marco Asensio unleased an absolute rocket from the edge of the box that bounced in off the underside of the crossbar. It was one of those stunning goals that freeze you in your tracks. What a strike. And what a result! At 3-1, Madrid are in fantastic shape to win the Supercopa, but they'll have to do so without Ronaldo as he'll be suspended for the next leg. He also pushed the referee a little as he exited the pitch, so we'll have to wait for a verdict on that as well. Cristiano Ronaldo next game is for the Spanish Super Cup on August 16 of 2017 against Barça. You can watch Juventus live stream, Real Madrid vs Barcelona, AC Milan vs FK Skhendija, Girona vs Manchester City, Everton vs Hadjuk Split, and Hoffenheim vs Liverpool, all matches provided from our live soccer game pages.